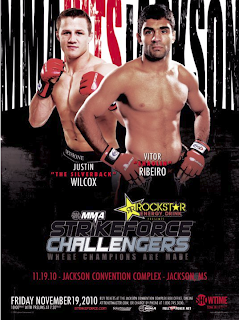 Strikeforce officials on Monday announced that a lightweight bout pitting Brazilian jiu-jitsu black belt Vitor "Shaolin" Ribeiro against Justin Wilcox will headline Strikeforce Challengers 12 on Nov. 19 at the Jackson Convention Complex in Jackson, Miss. The event will air live on Showtime at 11 p.m. ET/PT (delayed on the West Coast). Ribeiro is a decorated submission expert and one of the top 155-pound fighters in mixed martial arts. 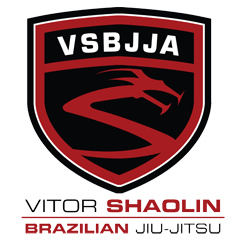 A four-time Brazilian jiu-jitsu world champion, he won once as a purple belt in 1996 and three straight times (1999-2001) as a black belt. His 20 MMA victories include 14 stoppages, 12 by submission. Ribeiro has defeated such notable fighters asJoachim Hansen, Eiji Mitsuoka and Mitsuhiro Ishida. Ribeiro’s losses have come against some of the lightweight division’s top talents -- Tatsuya Kawajiri, Gesias Cavalcante andShinya Aoki. He returned to the cage after a 10-month absence in May and lost a controversial split decision to the undefeated Lyle Beerbohm at Strikeforce “Heavy Artillery” in St. Louis. Wilcox, a 31-year-old former NCAA wrestling star and bodybuilder, has won his last four fights. In his most recent outing in March, he registered a unanimous decision overShamar Bailey at Strikeforce Challengers 7 in Fresno, Calif.
A member of the American Kickboxing Academy, Wilcox wrestled for Edinboro University of Pennsylvania. There, he befriended teammate Josh Koscheck, who turned his college wrestling buddy onto MMA and eventually brought Wilcox into the AKA family. Along with Bailey, Wilcox holds wins over “The Ultimate Fighter” Season 5 alumGabe Ruediger, Strikeforce fighter Bobby Voelker and Japanese mainstay Daisuke Nakamura. His three losses have all come to notable foes in Ishida, Chad Reiner and Bellator Fighting Championships veteran Dan Hornbuckle. In another featured televised bout, unbeaten lightweight Ryan Couture will face an opponent who has yet to be determined. The son of UFC hall of famer Randy Couture, he won his Strikeforce and MMA debut with a first-round triangle choke submission ofLucas Stark at a Challengers show in August. The younger Couture is a member of the Las Vegas-based Xtreme Couture Mixed Martial Arts fight team. Before winning his pro debut, the 28-year-old compiled an amateur record of 5-1-1, with all five wins coming by submission.